Discover Holland, a country dense with history and astonishing art. Find Rembrandt, Vermeer, and other old masters in the museums, or linger in the historic churches, cafes, and town squares that inspired them. 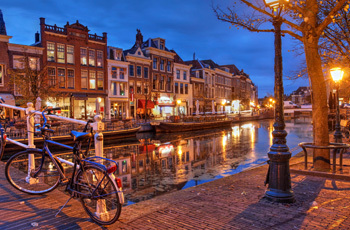 Stroll the picturesque canals or join the locals on a bike. The windmills, tulip fields, museums, and markets are calling! Stay in a vacation apartment in charming Leiden, with easy train access to all of Holland. Day trip options: Amsterdam, Delft, the Hague, Rotterdam, Haarlem, Utrecht, the Keukenhof Gardens, and many more! Day trips and Sightseeing: Holland (or correctly: “The Netherlands”) is a great little country that offers picturesque towns, superb museums, beautiful canals, windmills, excellent bicycling and exuberant flower exhibits. Will there be enough to do for 2 weeks? You bet. You’d need more time than this just to visit all the major museums. Besides, Belgium is not far either. Cities include: Amsterdam, Delft, The Hague, Rotterdam, Haarlem, Utrecht, Gouda. There is surely no single place in Europe with more world-class museums per square mile than Holland: Leiden alone has 12 museums, including the National Antiquities and Ethnology Museums; Van Gogh Museum and Rijksmuseum in Amsterdam, Kröller-Müller Museum, Porcelain Factory in Delft, Mauritshuis in The Hague, Boymans-Van Beuningen Museum in Rotterdam. Visits to the Keukenhof in Lisse, or the Aalsmeer Flower Auction will put flower lovers into seventh heaven. The windmills that everyone thinks of when they think of Holland are close by: Molenmuseum “De Valk” in Leiden, and The Kinderdijk between Rotterdam and Dordrecht. Even brief ventures into Belgium: Brugges (3 hours) and Brussels (2.5 hours) are possible. Off-the-beaten-track treasures that can’t be beat: Try a walking tour of Amsterdam and a tour of seventeenth-century Dutch Masters on display at the Rijksmuseum, both led by our staff person Marike, who is a knowledgeable museum guide, or attend a concert at the world-famous Royal Concertgebouw. Visit the Aalsmer Flower Auction. Even the humble pleasures of buying fresh bread and pastries at the bakery down the street or shopping for bread, cheese, spices, fish or flowers at Leiden’s open-air market are unforgettable on a Dutch Untour. One or two weeks in a private apartment in an 18th century townhouse in charming Leiden. Transfer by taxi to and from Amsterdam airport on arrival and departure. A 5 or 10-day Benelux Saver Rail Pass (good for Holland, Belgium, and Luxembourg) and limited bus tickets for ground transportation within Holland. An orientation session and informative Leiden walk by our superb local staff to start your trip on the right foot. Local information and our Going Dutch guidebook, researched and written by Untours staff, sharing local restaurants, must-see attractions and museums, and hidden treasures. A local cultural event, like a guided tour of the Peace Palace in the Hague, an Amsterdam walk, or a Pannekoeken (Dutch pancake) lunch. Please note that arrivals before March 27, 2019 are off-season. They do not include any on-site services such as airport transfers, orientation, welcome supplies, bus/tram tickets or Untours events. Local staff will meet you at the apartment with keys and be available by phone if you have a problem. We will give you instructions on how to make your own way by train and taxi from the airport to your apartment. The Benelux Saver Rail Pass, our Going Dutch guidebook, and use of an Untours cell phone are included.